Are you ready for your swimming pool tile to look BRAND NEW again, regardless of age? From the moment your pool was filled, calcium has been making unwelcome residence across your entire pool tile line. Thankfully, you can evict this unsightly guest and restore your tile’s lovely shine with a simple tile cleaning service. 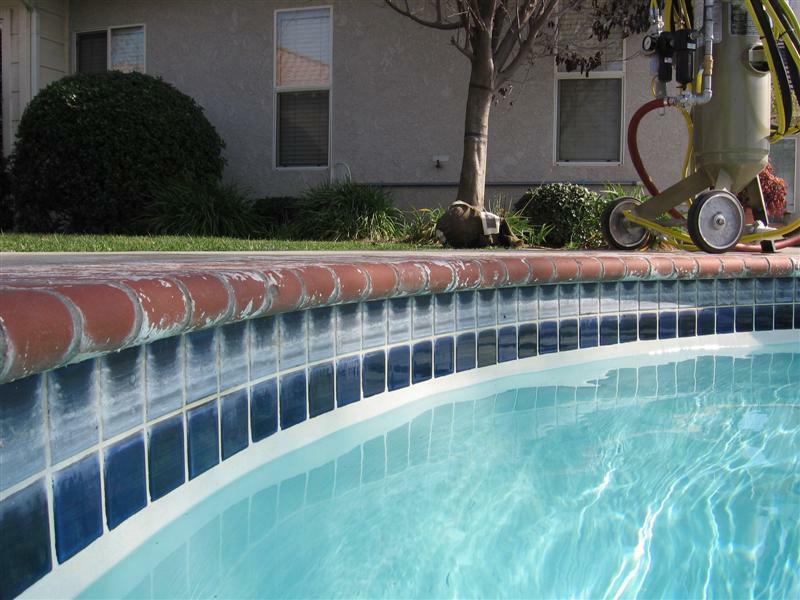 Dynamic Services provides professional and effective tile cleaning to pool-line tile in order to restore the tile to its original condition using advanced, industry-leading techniques throughout the Sacramento area. While replacing tile is often expensive, cleaning tile isn’t. An ounce of tile cleaning prevention can save you across the following months from a lengthy and expensive tile re-installation process. Once calcium build-up goes too far along without any paid attention, tile can become brittle, causing them to break off and fall into the pool. We will begin the service by draining the pool down to show the full area of tile. After we have removed the calcium from the tile, we then sponge the tile down by hand. This step removes any final residue or particlse that may be lying on the tile. It is at this step that you can see the luster of your pool tile being restored. Lastly, we will apply a sealant to ensure calcium does not return anytime soon, and vaccuum any debris that has accumulated on the bottom. This final step is just one extra way to show you that we care. Sample Service In Action – Prepare to Be Amazed! The video below showcases on-site tile cleaning with the glass bead-blasted solution described. Depending on both the severity of the build-up and the specification of the tile involved, there are three options available to you. Below, we briefly explain the benefits and applications of each of the three solutions we offer. For prevention, we offer a mild chemical application that both prevents the build-up of future calcium and strips up to 6 months of build-up. Also effective for post-Glass Bead Treatment to remove all remaining calcium and provide protection for up to a year. If the pool tile has not had noticeable build-up for longer than six months, we sponge down and use a formula safe for pools to remove the calcium. For concentrated calcium build-up beyond one year, we recommend our heaviest-duty treatment.